A huge crowd came to hear Grammy Award winning composer Julie Gold perform at Congregation M’kor Shalom in Cherry Hill. It was especially significant for Gold, whose piano teacher, Rae Goldberg, was in the audience and came to sit by her, once again, on her piano bench. Julie says that Goldberg, who resides at Lion’s Gate in Voorhees, is always in her heart and “on” her piano bench. 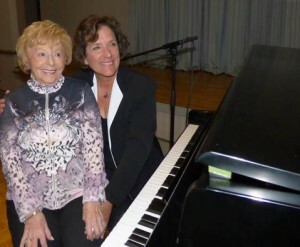 When Julie lived in the Philadelphia area, Goldberg was her piano teacher from age 6 to 16. Gold is proud to have four CD’s documenting her work over the years titled “Dream Loud”, “Try Love”, “The Girl I Found” and “Love is Love is Love.” Currently she is writing songs for the Oxford University Press for a series that teaches English to elementary school children all over the world. As the daughter of an immigrant, she sees this as her most meaningful endeavor to date. She has served on the Board of Governors for NARAS, the National Association of Recording Arts and Sciences and she is a guest artist for Lincoln Center’s prestigious Meet the Artist Series. Gold performs and gives motivational speeches throughout the country.